In the United States, investment in civil infrastructure is estimated to be $20 trillion. Annual costs amount to between 8-15% of the GDP for most industrialized nations. This investment is only likely to increase. Indeed, much attention has been focused in recent years on the declining state of the aging infrastructure in the U.S. These concerns apply not only to civil engineering structures, such as the nation's bridges, highways, and buildings, as well as other types of structures such as the aging fleet of aircraft currently in use by airlines. The ability to continuously monitor the integrity of civil infrastructure in real time offers the opportunity to reduce maintenance and inspection costs, while providing for increased safety to the public. Furthermore, after natural disasters, it is imperative that emergency facilities and evacuation routes, including bridges and highways, be assessed for safety. Addressing these issues is the goal of structural health monitoring (SHM). 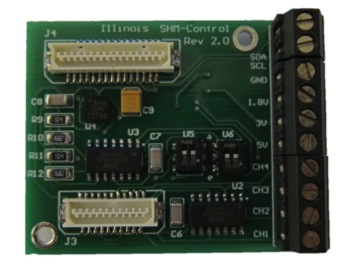 The Illinois Structural Health Monitoring Project has shown the promise of providing an inexpensive means for continuous and reliable SHM using dense arrays of wireless sensors. The project has focused on developing methods for monitoring bridges using sensor networks. Manual inspection of bridges costs millions of dollars, is relatively unreliable, and can only be carried out sporadically. Some real world deployments of a dense array of sensors show that they can provide detailed information on civil infrastructure, which typically consists of a large number of components and has many degrees of freedom. For example, monitoring the Tsing Ma Bridge and Kap Shui Mun Bridge in Hong Kong, which uses 326 channels of sensors in total and produces about 65 MBytes of data every hour, is an attempt toward in-depth monitoring. However, the enormous expense of installing traditional monitoring systems has significantly limited deployment. For example, the total system cost of the monitoring system (including installation) on the Bill Emerson Memorial Bridge in Cape Girardeau, Missouri, USA is approximately $1.3M for 86 accelerometers, which makes the average installed cost per sensor a little over $15,000. Costs for other bridge installations are of a similar magnitude. We have developed a new technique employing arrays of low-cost wireless sensor networks to effectively monitor civil infrastructure. Our technology employs concurrent and distributed real-time processing to overcome the limitations inherent in traditional centralized approaches. Using our techniques, smart sensors with wireless communication capability can reduce installation effort by almost two orders of magnitude. domain-specific sensors. We have designed, developed and tested sensitive digital sensors for SHM that can be manufactured very cheaply and integrated with embedded computers such as Imotes. 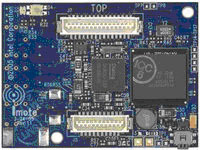 New power harvesting devices have also appeared on the market making long term deployment of small embedded computers feasible without incurring the cost of wiring. Moreover, the lack of wiring eliminates one potential cause of failure. While networks of densely deployed smart sensors have the potential to improve SHM dramatically, limited resources on smart sensors preclude direct application of traditional monitoring strategies on smart sensor networks. Consider structures such as the 2km long Akashi-Kaikyo Bridge or the 443m tall Sears Tower in Chicago: the task of locating a few strategic sensors in such a structure so that these sensors can detect randomly occurring damage is intractable. To effectively detect arbitrary damage in complex structures, a dense array of sensors distributed over the entire structure will be required. However, the traditional centralized approach for SHM is not feasible with moderate to large numbers of sensors: tremendous amounts of data must be sent to such a central station, requiring expensive, difficult-to-install wired networking and introducing a single point of failure. Our research in distributed SHM using wireless sensor networks overcomes these problems and promises a robust, significantly lower-cost, safer alternative to traditional structure inspection techniques. Typically, a wireless sensor unit consists of a sensing interface, computing core, onboard memory, and wireless radio. For feedback applications, an actuation interface is often included on the same platform for control application. Their onboard sensing, processing and actuation capabilities have made wireless sensor networks (WSN) an exciting alternative to traditional tethered systems for control and monitoring applications. However, the real-time requirements vary widely between monitoring and feedback applications. For the former, the focus is on data resolution and processing quality, so anti-aliasing filters and high-resolution analog-to-digital converters are used. These hardware implementations can introduce significant latency. On the other hand, real-time performance is essential for structural control applications. Time delay between sampling and control application due to data communication, processing time, and hardware can limit the sampling rate of the system. Additionally, time delays and lags due to sensor delays, processing time, or actuator dynamics may lead to instability and poorer control performance when not accounted for in the design. The most common ADC architecture used in wireless control literature is a successive-approximation-register (SAR) type. An SAR type ADC has minimal latency and is appropriate for high-resolution, medium throughput applications; thus, an SAR-type ADC is a good choice for wireless structural control. An extension board for the Imote2 platform has been developed to provide this functionality for WSN-based structural health monitoring and control deployments. Through the combination of an SAR-type ADC and a digital-to-analog converter, this hardware enables Imote2 wireless nodes to become low-latency sensor-actuators suitable to the real-time requirements of wireless control applications. A prototype of the SHM system utilizing Intel Imote2 sensors has been implemented in a laboratory setting for a scale model of a truss bridge; however, only full scale deployment and evaluation on a real structure can confirm the viability of this approach in a commercial setting. We are therefore designing, deploying, and testing a fully-functional smart sensor-based SHM system on an existing truss bridge. Successful accomplishment of this goal will result in a first of its kind autonomous sensor network system for monitoring of civil infrastructure. A software library of customizable services has been developed and is available for use by researchers. The SHM Services Toolsuite is an open source collaboration that provides services for, and examples of, SHM applications. The library currently provides the services necessary to implement the Stochastic Damage Locating Vector (SDLV) method in a network of Imote2s. This method requires synchronized acceleration data from a network of sensors and uses the Natural Excitation Technique (NExT) and the Eigensystem Realization Algorithm (ERA) for system identification. The services provided can be divided into three primary categories: application services, application tools, and utilities. The application services are the numerical services necessary to implement the SDLV method on the Imote2s, and includes test application modules to test each on both the PC and the imote2. The utilities include services which facilitate network development. The tools include a data collection applications for gathering synchronized sensor data from the network, as well as an application to test radio communication.